Advantages: Packed with attractive profiles; many and varied colours and markings across all Spitfire PR variants; logically organised by variant; detailed and useful captions describing ops, colours, markings and unusual features; specific references cited; great source of inspiration for modellers. The latest release in the Aviation Workshop Profiles series is "Photo-Reconnaissance Spitfires in Worldwide Service", by Jon Freeman. In common with earlier titles in the series, this 48 page soft-cover book is crammed full of artwork of the subject - in this case 94 profiles of PR Spitfifres in all marks and in worldwide service. 22 of the aircraft are depicted in four-view diagrams on a full page. Jon Freeman's artwork will already be familiar to many of HyperScale's visitors, and his work here is clean, clear and very attractive. Three pages of reference photos include several nice wartime colour photos. The book is logically structured by PR Spitfire variants including aircraft serving in the ETO, MTO, FAA and SEAC; plus post-war and international operators. If you ever thought Spitfire camouflage was a bit boring, this book might just change your mind. Whether your preference is pastel pinks, greens or blues; or if your taste runs to PRU Blue by itself or in combination with greys or white; Ocean Grey and Dark Green; or Dark Blue, then you'll find an attractive finish to dress your Spitfire model. Indeed, there are many other colour combinations covered in addition to those mentioned in this paragraph. When theatre markings, various styles of national markings (many featuring non-standard colours, sizes and locations) and nose art are thrown into the mix, we are presented with a fascinating camouflage case study. If you want to see some of these schemes in three dimensions, there is no shortage of available models on the marketplace. Between Tamiya, Hasegawa, ICM, Academy and Airfix; in combination with commonly available conversions and after-market canopies from Falcon, you should be able to build virtually any of the aircraft depicted between the covers. Even better news for modellers is that Model Alliance will be releasing three decal sheets in the near future covering subjects in this title. 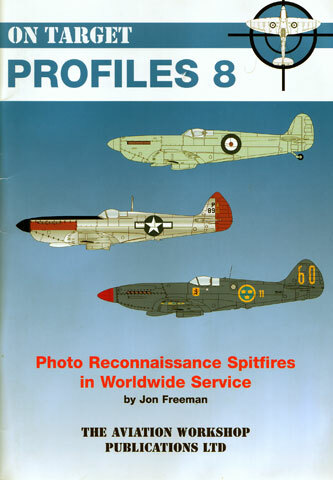 On Target Profiles 8 - "Photo-Reconnaissance Spitfires in Worldwide Service" is a terrific title that will provide plenty of inspiration for modellers, and also specifically points the reader to more photos and information.